Gazprom, Russia's gas monopoly, has threatened to cut supplies to Ukraine by 25% - just two weeks after the two sides had seemingly ended their row. The state-run Russian company said supplies to Ukraine would be reduced from 3 March unless Ukraine agreed to pay the arrears it is said to owe. 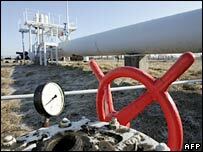 A previous row between the two sides saw Russia cut gas to Ukraine in 2006, also hitting exports to western Europe. Western commentators accuse Moscow of using Gazprom as a political tool. They say the gas dispute is just a small sign of the Kremlin's continuing anger at the Ukrainian government's pro-Western stance. Earlier this month, Russia said it might target its missiles at Ukraine if its neighbour joined Nato and accepted the deployment of the US missile defence shield. 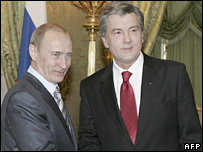 The Russian and Ukrainian governments had apparently resolved the gas dispute two weeks ago after talks between President Vladimir Putin and Ukraine's President, Viktor Yushchenko. However, the two presidents had only secured an outline deal, and it appears their officials have since failed to reach agreement on the exact details. Gazprom said in a statement that 1.9 billion cubic metres of gas had gone missing and were now considered Ukrainian debt. President Yushchenko has now ordered his Prime Minister, Yulia Tymoshenko, to "take urgent and exhaustive measures to pay Ukraine's debt for gas consumed". "The government must fulfil all the high-level agreements," he added. The European Commission said it had been assured by Gazprom supplies to the bloc would not be affected by any cut in exports to Ukraine.